Tonight was Yes�s seventh live appearance at the Royal Albert Hall according to Forgotten Yesterdays records, and my second seeing them there. This time I was in a loggia box on Chris Squire�s side, alternating between first and second row. Plush. The sound was a little improved for me compared to last night� but not hugely better, unfortunately. Even so, watching the band perform �Awaken�, among others, in this august venue was sublime. There were also fewer technical problems than yesterday evening. 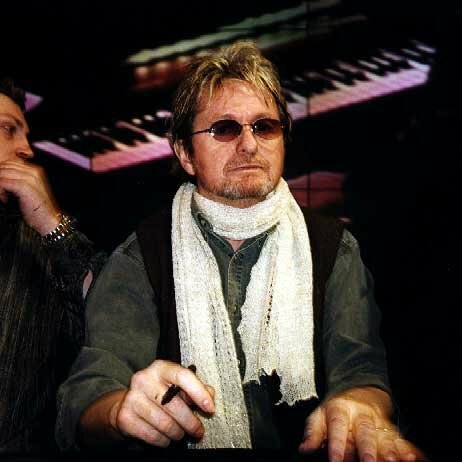 Last night, Jon Anderson mentioned the legendary Cream farewell gig that Yes played on 26th November 1968. This evening he made reference to the �historic� thirty years or so that had elapsed since their previous RAH appearances. 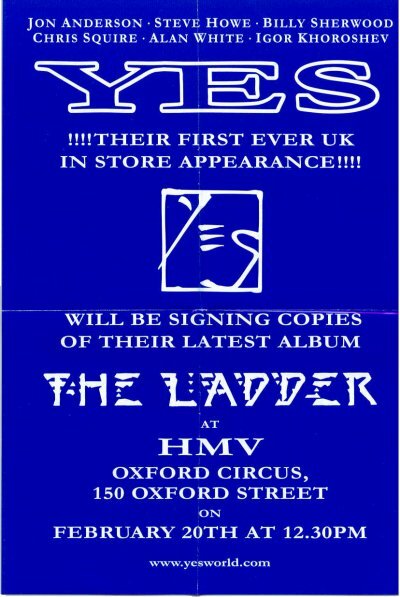 The Yes day started much earlier for many of us, with a long wait outside the flagship HMV store in London�s Oxford Street, where the band was appearing for a signing session. I took a few photos for friends, had a coffee with one afterwards, and then headed off to take in a couple of art galleries before the evening�s concert. A memorable weekend. We (my wife Maria, my long term Yesgig accomplice Martin and his girlfriend Abi) arranged via the Net to meet up with a load of Yesfans in the Finnegans Wake Pub near the Albert Hall. There were people from all over the world, Americans, Kiwis, Scandinavians etc. we had a great time. The concert was marvelous, from the Firebird into Yours Is No disgrace.... AND Perpetual Change amazing! The Ladder tunes were excellent espeacially Homeworld, what a great Yessong. Back to the pub after the gig, shame it was Sunday, bloody British licencing hours! Just thought I'd add some thoughts to what's already been posted: terrific gig, there was a really good atmosphere throughout, and particularly at the end when the family members joined in. I've been going to see them live for the best part of thirty years and this was my first time in the front row of the stalls - right in front of Billy. Best moments: Perpetual Change - first time I've seen this complete song; Disgrace - this has always been a stonking live song; All Good People - Virgil Howe going bananas with Jon's percussion; Hearts - as someone who doesn't much like 90125 I was surprised how much I liked this; Awaken - it's all been said. At the end my other half and I got to the front of the stage and I could see Billy's cue notes - chords to the beginnings of Homeworld and Owner. He's also a South Park fan - he had a picture of Cartman (?) and the Canadian flag on the floor by his pedals. Good luck charms perhaps?? We also managed to get one of his plectrums!!! I hope all these murmurings we've been hearing about this being their last tour are untrue, but if not I'll have very fond memories of this particular gig. Looking forward to the DVD!! I went to the two Albert Hall gigs: great shows and very nice to meet numerous 'Net Yes fans. Fantastic weekend all round. First night was great, with sublime performances of "Awaken" and "And You and I" (or the Buffy song, as I shall henceforth call it), but they were perhaps a bit slow to warm up. Second night seemed more even, or maybe I was just more used to the set list, with a fantastic "Perpetual Change". Khoroshev's pre-"Awaken" solo seemed a bit more developed than the one boot I've heard of the US leg (18 Oct, Tampa). He threw some nice flourishes into "Perpetual Change" and was great on "Cinema". I noticed Sherwood's backing vocals more than on the last tour. He's doing some great work there, but Sherwood's still getting regular stick in 'Net forums for his live guitar work. I thought that, while he seemed very tentative in his soloing, he played well enough -- although the poor guy can hardly compete with Howe! Steve was totally on fire throughout: he may not like "Owner...", but his solos both nights were awesome. 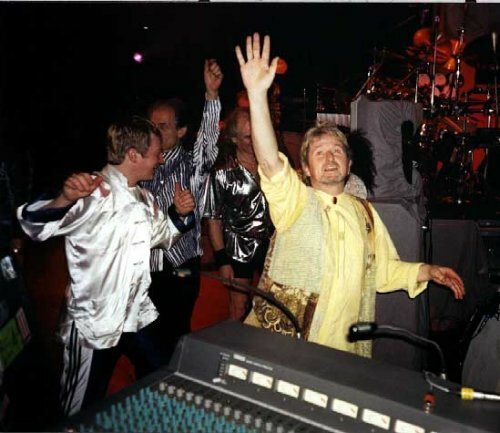 The band generally seem to have really gelled compared to the OYE tour: very together, looking very happy on stage. Virgil Howe, Damion Anderson and Jade Anderson appeared on stage during the encore on Sunday, beckoned on by Khoroshev, banging assorted percussion and dancing about. It was a family affair all round: also in attendance were Squire's and White's mums and Carmen Squire. Quite simply one of the most amazing days of my life. First of all meeting the band for the first time in HMV (see seperate post), then get this, my tickets (bought through the internet) are marked Arena F Row 3 Seats 19 and twenty. So I'm thinking, it's going to be good seats at least, although having never been at The Albert Hall I'm not too sure. So we appear from along a corridor and up a flight of stairs to come out at the section of seats in front of the stage. I'm getting very excited. Then the guy checking the tickets says "front row in the middle". Well I nearly fainted ! and sure enough right in front of Chris Squire we were, unbelievable. 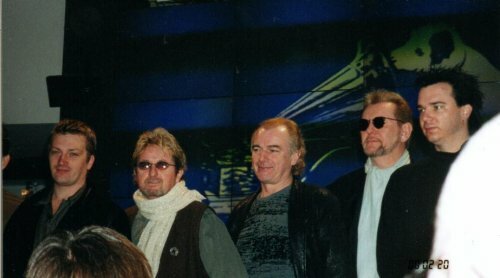 The show was over before it sunk in that I was in the front row at a Yes gig at The Royal Albert Hall ! (I'm not gloating honest, I'm just still dumbstruck!). The show itself was phenominal, certainly the sound wasn't the best, but to be able to see all that action close up was something else. During I've Seen All Good People the front stalls (and the back stalls when they saw what was happening, my nephew who was in the circle later told me) rushed to the stage, it was like being back in the Glasgow Apollo (although if you were right in front of the stage at the Glasgow Apollo it was a disaster as the stage was 15 feet high). The band were totally on fire and the crowd were going crazy during All Good People and the encores, especially during Roundabout, so much so that Steve Howes son ( Virgil ?) and Jons son and daughter (?Damien and Jennifer) appeared at the back of the stage dancing about, then started bashing away on Jon's percussion stuff, it really was magical and fitted right in with the atmospere. Jon's wife Jane appeared on the stage also at the end. I really didn't want to leave. Anyway for someone who's still dumbstruck I'm going on an awful lot, I think you get the idea. (My wife took some great picks, I'll post them soon). P.S. To cap off this amazing weekend (having seen them in Glasgow on Thursday) we missed our flights back to Glasgow after having realised we'd left our plane tickets and other stuff back in the Hotel. A mad dash ensued. My wife is a very emotional person and this was the first time she had spent a night away from the kids and was quite weepy at the thought of maybe having to spend another night away from them. I rushed into Luton Airport hoping the flight had been delayed, but to no availe (?) I turned back to my wife who was just making her way into the check in foyer with the bags shaking my head. She immediately burst into tears. The airline rep. was very good and said she should be able to get us on a later flight. ( God, I'm really going on aren't I, don't worry, nearly there). So I'm at the airline desk phoning my mother -in -law who's got the kids ( who are 3 and 7 BTW, boys) to tell her we've missed our flight. My wife who's still crying, although easing off by now starts to gradually ease away from me staring over my shoulder. I'm aware of a prescence behind me and look round to see a camera crew filming us. So here's me once again trying not to look like a prick (see my post on HMV) although this time failing miserably I feel. So shortly the whole of the UK will be seeing our dramatic neigh(?) emotional entrance to Luton airport on one of these fly on the wall airport documentaries. At least I'll have got a Yes T-shirt on tv. Actually we've only just got back and settled the kids, but I thought I'd share all this with you. This was an absolute corker of a show, quite possibly the best Yesshow I've ever been to. The sound was excellent, the playing magnificent (I didn't pick up on one forgotten lyric from Jon although he 'forgot' the title of Face to Face as he introduced it). The undoubted star of the show for me was Steve. He was simply superb. All the things I've seen/heard him try to do in the past and didn't quite make it, really came off. I was soooo jealous of the folk in the stalls who could get down to the front of the stage and really boogie. I'm sure we'll be hearing from some of them. I saw my mission as trying to whip up some enthusiasm from the folk in the circle who were somewhat restrained to say the least. There were just so many highlights....I cried at least 5 times during the show (YiND, Homeworld, PC, Awaken and Roundabout) because I just couldn't believe how joyous this all was. Steve's rendition of Clap was the best I've ever heard, Jon was in great voice, Igor was superb (although I still don't think he's got Awaken quite 'right'). Chris and Alan were really solid although there appeared to be the occasional PA buzz on Chris. A few nice little moments; after Awaken, Jon went over to hug Jane who was at the side of the stage...as he walked back to centre stage, Igor ran round and hugged her too (can't say I blame him!). During Roundabout, Damien and Jade Anderson and Virgil Howe all appeared at the back of the stage and assisted in percussion and dancing duties...they joined Jane and the band for the final bows. 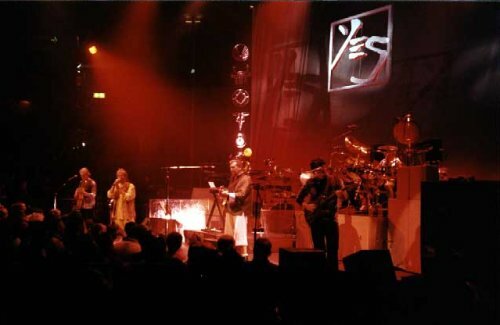 I believe the the next Yes album will be a live album from the current tour. I really hope they taped this show for the purpose because it was just superb, superb, superb. Thanks guys and come back soon! Having attended every tour since Tormatour I have to say that this was probably the best, with only that first Wembley show and ABWH challenging. The Royal Albert Hall is a classy concert venue and once the mix was right our sound was good. Our seats were first row on the third balcony and we looked down over Igor and Steve. 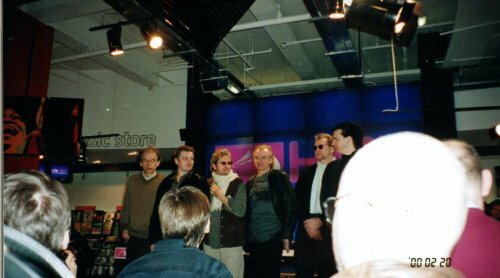 A lot has said about Steve's distance from the band, lack of smiling etc. From where we sat he has every reason to look anxious. His perfection in the studio presents him with an awesome challenge on stage and to turn it out every night maximum concentration is necessary. He came off his carpet more than once and nearly played Clap in the crowd itself they were so close to him! What an under rated Guitarist he is! Igor was superb throughout - particularly in Awaken - and enthusiastic in his encouragement during the encores of the Anderson children and Virgil Howe who took to the stage. 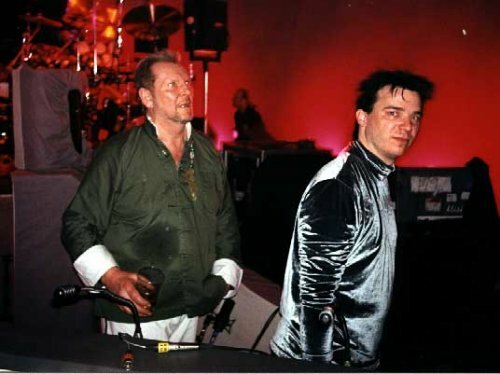 All he and Billy now need is some encouragement to join the fashion stakes of the other band members! And as for Mr Anderson, well Jon is Jon, calm, collected, in good voice - we all feel a bit cosmic in his presence! It is always good to tour a great album and The Ladder certainly meets this criterion. The live choices from it were good but having followed the tour through this website from South America to Europe wonder why songs like Nine Voices and New Languages were dropped. 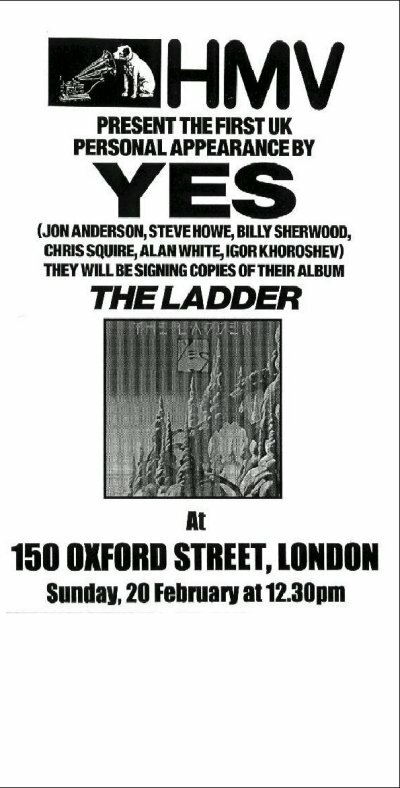 Having said that being a Yes fan means "you can't always git what you want�" so you take what is offered. AYAI was its usual awesome self and Awaken was the best ever with unbelievable performances from Chris and Igor. The snow effect was excellent from up on high as it fell through the lighting. Perpetual Change was superb as would YIND have been if Steve's amp had been switched on from the start! The complaints about the Roundabout version are strange - granted its not the full version - but it is the one I have on the Classic YES 7" single. I had hoped for Leaves of Green but maybe next time - along with some Relayer? Now is a dangerous time for the band. Following a great album and tour the old egos normally come out and reap havoc. Let's hope they have learnt the lessons of the past. Thank you so much. Thank you. Thank you very much. It's great to be with you this evening. Thank you all for coming out. On this night to this wonderful, wonderful building. Thank you Queen Victoria for getting it together. This..and..uh I'd like to call tonight not Royal Albert Hall. We're going to call it the house of Yes. Steve Howe on guitar. Thank you so much. Thank you. For a change of pace we're going to do a couple of songs from the new album and..uh a quick reminder for myself we did the album in Vancouver last winter. I think it was last winter. It's all a dream baby, like life. Anyway the producer is..uh this guy Bruce Fairburn. He's a great guy, great teacher and he loved Yes music very much and he said be adventurous. So we were very adventurous as you can tell if you got the album. Yes. So who..we're going to start off with a song. It's called 'Lightening Strikes' and lightening can strike at any level as long as its the lightening of love. Love. Chris Squire on bass guitar. [???] dedicated that song to his new born son. Two weeks old. Cameron. Hey. [???] lightening strikes. Hey. [???] look after Cameron and Cameron is going to get a good time. We love them, little boys. Little boys. We're going to do a song which..uh again from the new album. I was writing words about it and Bruce said "Why don't you write about somebody who changed your life musically" and I thought Bob Marley right away and..uh so we dedicate this song for Bob Marley, the legend and..uh [???] just finished recording track and walked outside. He was on MTV [???] in the lounge. Here is "The Messenger". Alright. Thank you so much. Thank you. This is a dedication to my wonderful wife Jane. [???] time, keeps me going and..uh [???]. ..new album, [???] the title I think about it everyday "It Will Be A Good Day"
Woo! Thank you so much. Thank you. As with last night..uh tonight [???] tricky part and ask you all, first of all to stand up. Everybody standing up. C'mon, stretch your legs. It's very easy. We're going to do..uh sorta, real sorta African, Ethiopian, Caribbean dance song sort of high life music and the chorus is, the chorus is. I can't remember. The chorus is "The promise will come when the promise is made" so please sing along. The song is called 'Face To Face'. Here's a song that's called 'Hearts'. Billy Sherwood on guitar. Thank you. I'd to introduce you to a really wonderful, wonderful, crazy, wonderful guy who actually comes from Moscow just so you know [???] now. Great keyboard player. Here he is Mr. Igor Khoroshev. ..May, who follows us around. [???] 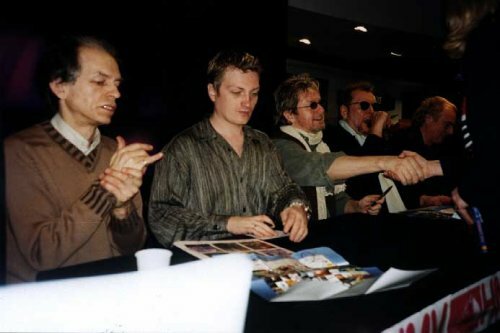 giving autographs. She's the most wonderful lady. We're all going to sing along to this and halfway through we get up and dance a little bit and sing a great John Lennon song with us, okay? You'll remember it. Here it goes. Thank you so much. Thank you. As most of you know its probably a historic night for us. Thirty years later we come to the Albert Hall and..uh we thank you all for staying with this band for such a long time. [???]. We really appreciated it. Here's a song that I think you all know. Here we go.